In this interactive, fun show, Jeff Civillico rides a unicycle and juggles at the same time! That's just the beginning of a hilariously zany night! 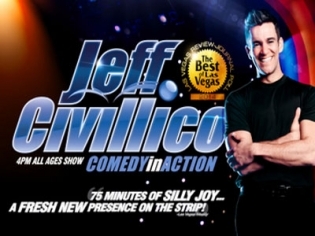 Save up to $24 off tickets to see Jeff Civillico. Hurry and book your tickets today to save up to $28/pc. Tickets Start at $26 before taxes/fees. No promotion code needed to book. Known originally as a talented juggler, Jeff Civillico is also a master entertainer with a zany personality. He blends physical stunts with audience interaction to create a show that appeals to all ages. His one-man show will have you belly laughing the whole way through and amazed at how funny and talented one man can be! Is it art? Is it a circus act? Maybe a comedy routine? Whatever you want to call Jeff Civillico’s show, it is hilarious, entertaining and unique. Jeff mingles in the audience prior to the show, then jumps on stage with boundless energy to begin an hour of non-stop comedy and entertainment. Jeff uses volunteers from the audience to help him with much of his physical comedy including a unicycle and straitjacket. Full of personality and charisma, Jeff is genuinely funny and spontaneous and it is obvious that he loves what he is doing. The show is appropriate for children and Jeff goes out of his way to include them in the interaction. Some of the humor for the adults will purposely go over their heads, but they will enjoy it and want to hang around afterwards for the autograph session that Jeff is always willing to give! It is a great way to spend an hour or two out of the heat and take a break from the pool. Jeff reminds me of Jim Carrey…on speed! Funny and a fantastic juggler. He has audience participation and the night I went he had 2 guys come on stage and help him get on a very high unicycle. No way to describe what happened…all I can say is I laughed harder than I had in years.Great talent! We took our grandchildren to this show and we all had fun. The humor is kid and adult friendly. The kids liked the juggling. The price is reasonable and the venue is nice. If you’re looking for a show to go to with kids, check this one out. Loved Jeff’s show. I took the whole family and really appreciated that it was family friendly. It was really entertaining and funny. I will have to go again. Jeff is absolutely the best juggler I have ever seen in my life! He is a pure joy to watch. His comedic timing and improv skills are absolutely brilliant! My wife and I laughed the entire show. I had the unique pleasure of being called up on stage and was in one of his skits. He had the audience laughing hard at my expense but I must say it made me feel like an important part of the show. He is a good natured guy and works extremely hard to leave a lasting impression on the audience. You will be very glad you saw his show. For amazing draw dropping juggling skills and constant side splitting laughter go see this act!!! You might even be lucky enough to be a part of his act. This act was one of my favorites! Jeff Civillico is such a talented guy! He really knew how to keep the audiences attention! We all laughed so hard! Thank gosh I had tissues in my purse because I really was laughing til I cried! I was not expecting to react to his show with such enthusiasm but Jeff made it incredibly easy to enjoy myself! I’ve been Vegas quite a few times and Comedy in Action was a hilarious breath of fresh air. Jeff performed many different acts, juggling anything and everything you can imagine while engaging the audience. Highly recommended! Civillico is amazing! So talented. Highly recommended show. Better than Blue Man Group and Penn and teller… and half the cost. Jeff is one of the most talented people on and off the strip! His show is electrifying, energetic and his comedic timing is genius:) A great family show! !